hostel DEN, Tokio, Japonia : Rezerwuj teraz! The building is a former office building, freshly renovated. We made our hostel modern, but also gave it a touch of traditional Japan, using Japanese color schemes and paintings, and also putting tatami (bamboo mats) into our 1st floor lounge area. 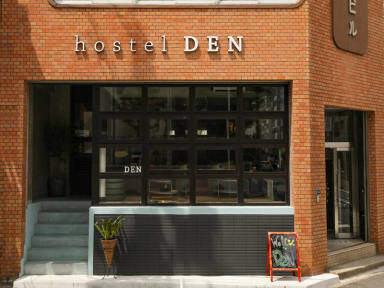 DEN is also the first hostel in Japan to attend to the needs of travelers from any country, as we have a prayer room free for our guests to use. We have four different types of rooms, including mixed and female dormitories, and two types of private rooms. Although our beds are simple, our guests will feel the most comfort staying in them, as each room has large windows that bring in plenty of sunlight during the day. We also want our guests to feel secure in our rooms, so we have provided lockers and luggage chains in each of our dormitory rooms. Great place, the best hostel I have ever been too. I send pictures of that place to my family to show how hostels in Japan look like!